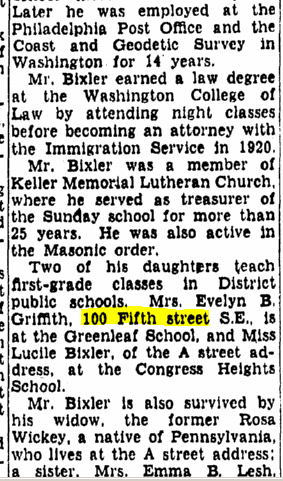 Washington Sunday Star, 6 March 1949, p. 2. 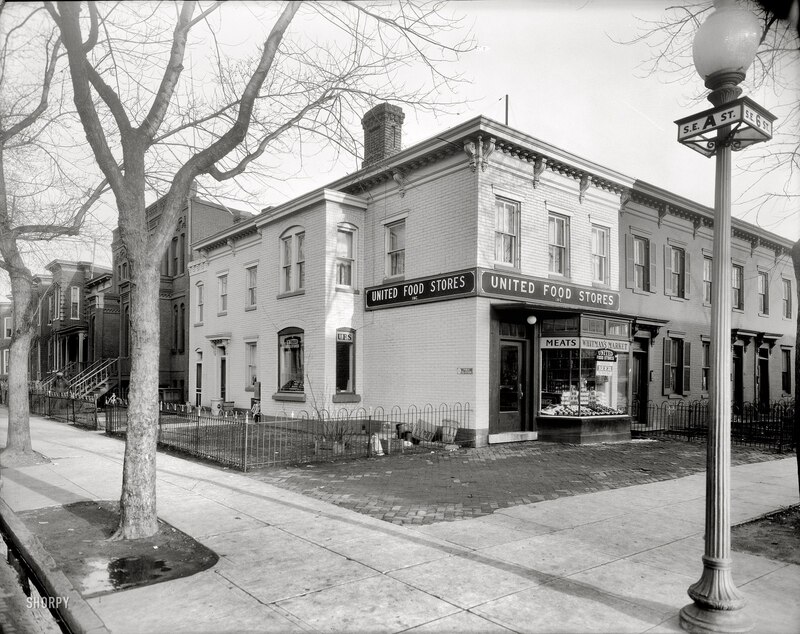 Federal census, 1940, 25 Fifth Street, S.E., Washington, D.C.
Athol B. Gilmore (owns, $4,000), head, 60, completed 12th grade, b. in S.C., lived in same place in 1935, agent, insurance company, income $2,000. Marian D. Gilmore, wife, 54, completed 12th grade, b. in S.C., lived in same place in 1935. Athol B. Gilmore, Jr., son, 17, single, completed 12th grade, b. in D.C., lived in same place in 1935. 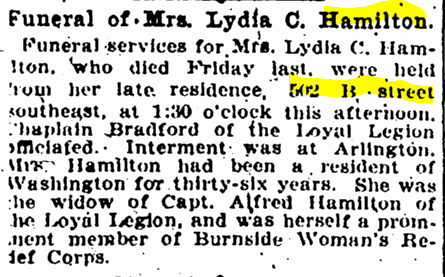 Ella D. Brooks, sister-in-law, 52, widow, completed 10th grade, b. in S.C., lived in Wilmington, S.C., in 1935. Hannah Hawkins (rents, $40), head, 75, widow, completed 12th grade, b. in Penn., lived in same house in 1935. Leander J. Moody (rents, $32.50), head, 60, single, completed 3 years of college, b. in Maine, lived in same place in 1935, attorney, government, income $3,500. 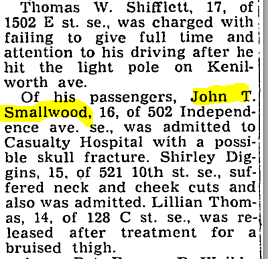 John E. Trail (rents, $37.50), head, 28, completed 8th grade, b. in W.Va., lived on army post, Hawaii, in 1935, carpenter, construction, income $730. Mary E. Trail, wife, 30, completed 10th grade, b. in W.Va., lived in same place in 1935, waitress, lunch counter, income $860. 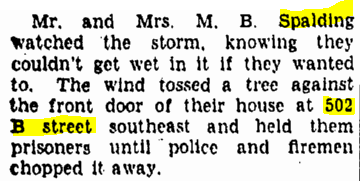 Washington Evening Star, 25 January 1873, p. 4. 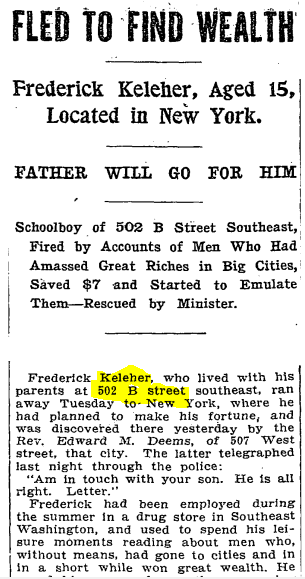 Washington Evening Star, 22 May 1875, p. 3. E. D. Town (captain, police). Samuel A. H. McKim (physician; surgeon, Metropolitan Police); Mary A. Mirick (teacher). S. A. H. McKim (physician); Mary A. Mirick (teacher). Samuel A. H. McKim (physician). Samuel A. H. McKim (physician); Andrew J. Carrier (clerk, Census Office); Mary A. Mirick (teacher). Mary Mirick (teacher); Samuel A. H. McKim. Samuel A. H. McKim (physician) [also the president of the Potomac Fruit Growers’ Improvement Company]; Mary Mirick (teacher). Samuel A. H. McKim (physician); Mary Mirick (teacher). Samuel A. H. McKim (physician); Mary A. Mirick (teacher). Mary A. Mirick (teacher); Samuel A. H. McKim (physician). William Saunders (watchman, Capitol Police); Samuel A. H. McKim (physician); Mary A. Minick [sic] (teacher). Emma McKim (clerk); Samuel A. H. McKim (physician); Everard Bierer, Jr. (clerk, pension applications [? ], boards). 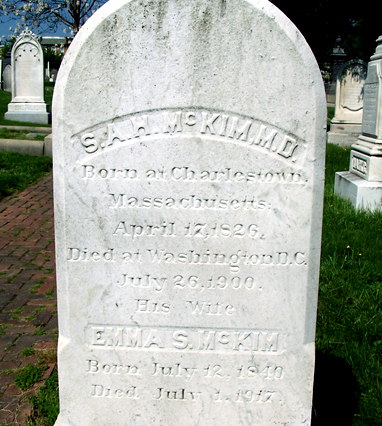 Mary E. McKim (typewriter); Samuel A. H. McKim (physician). Mary A. Mirick; Samuel A. H. McKim (physician); Mary E. McKim (stenographer and typewriter). Naomi Baker (clerk, Pension Office); Mary E. McKim (stenographer); Samuel A. H. McKim (physician). Mary A. Hendley (widow of William Hendley); Mary H. Hill. 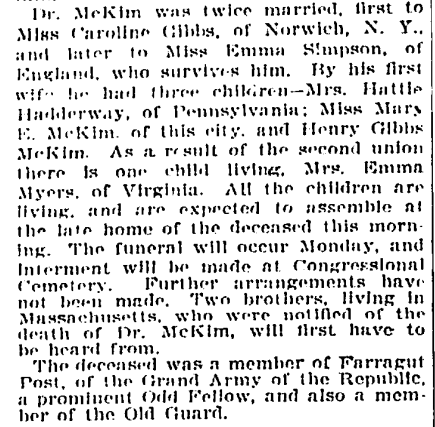 Mary E. McKim (stenographer); Samuel A. H. McKim (physician); Mary A. Hendley (widow of William Hendley); Oliver A. T. Swain (physician; home 321 E St., NE); Mary H. Hill. Frank C. Alexander (clerk); Joseph S. Stimson (draughtsman, Treasury Department). Frank C. Alexander (clerk); Frank V. De Costa (clerk, Capitol); Joseph Stimson (draughtsman). Robert C. Harris (confectioner); Horace E. Alexander, Jr. (collector); Guy C. Harris (Acme Candy Factory). Samuel T. Kalbfus (assistant assessor, District Building). John A. Jarboe; Samuel T. Kalbfus (assistant assessor, District Building). Franklin Atypical and Special School. 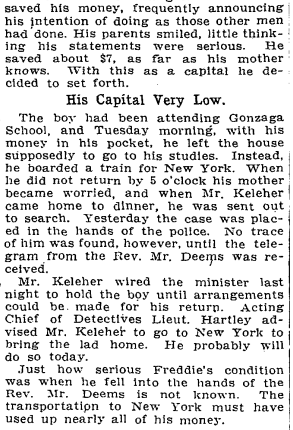 Washington Post, 27 July 1900, p. 2. DEATH OF DR. SAMUEL A. H. M’KIM. Was a Veteran Physician and Long Identified with District Affairs. Dr. Samuel A. H. McKim, aged seventy-four years, a practitioner of medicine in the District of Columbia for forty-eight years, died suddenly of paralysis at his residence, at the northwest corner of Fifth and A streets southeast, about 5 o’clock yesterday afternoon. He had been confined to his home by ill health for the past two years. During recent months he had suffered five paralytic strokes. Dr. McKim was one of the best known residents of Washington. He was born in Massachusetts April 17, 1826. His grandparents came to this city from England in 1804 [?]. His parents were married here in 1815, afterward moved to Massachusetts, returning in 1844. 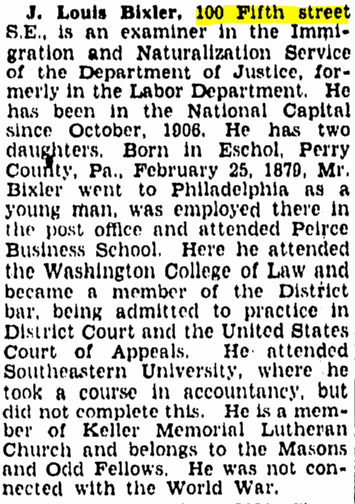 The father became paymaster at the Marine Barracks and placed the son in Columbian University, from which the latter was graduated in medicine in the spring of 1852. He entered upon a physician’s career immediately and was an exceedingly active man during the early years of the civil war. He was appointed surgeon to the local police department in 1860 [? ], serving in that capacity thirty-two years. He was the first medical assistant to the local police force. In February, 1861, he organized a company of militia for the defense of the city of Washington, and was assigned to guard the Benning Bridge. About that time he was also visiting physician to the Washington Asylum, and in April, 1861, he became acting assistant surgeon in the army, doing duty in the military hospitals in this city. In 1889 he was appointed surgeon of the Third Battallion of the District of Columbia National Guard, with rank of lieutenant, and in June, 1893, was attached to the First Regiment of the same organization, with the rank of Captain. He retired about two years ago. Dr. McKim was twice married, first to Miss Caroline Gibbs, of Norwich, N. Y., and later to Miss Emma Simpson, of England, who survives him. By his first wife he had three children—Mrs. Hattie Hadderway, of Pennsylvania; Miss Mary E. McKim, of this city; and Henry Gibbs McKim. As a result of the second union there is one child living, Mrs. Emma Myers, of Virginia. All the children are living and are expected to assemble at the late home of the deceased this morning. The funeral will occur Monday, and interment will be made at Congressional Cemetery. Further arrangements have not been made. Two brothers, living in Massachusetts, who were notified of the death of Dr. McKim, will first have to be heard from. The deceased was a member of Farragut Post, of the Grand Army of the Republic, a prominent Odd Fellow, and also a member of the Old Guard. Federal census, 1880, 25 Fifth St., S.E., Washington, D.C.
S. A. H. McKim, 64, physician, b. in Mass., father b. in Maine, mother b. in Mass. Emma McKim, 40, wife, keeping house, b. in England, parents b. in England. Mary McKim, 22, daughter, single, b. in D.C., parents b. in Mass. Hattie McKim, 20, daughter, single, b. in D.C., parents b. in Mass. Henry, 18, son, single, farmer, b. in D.C., parents b. in Mass. Emma McKim, 8, daughter, b. in D.C., father b. in Mass., mother b. in England. James Carrier, 40, board, married, lawyer, b. in England, parents b. in England. Lucy Woolmer, 69, boarder, widow, at home, b. in Mass., parents b. in Mass. Christine Woodruff, 40, boarder, widow, at home, b. in N.Y., parents b. in Mass. Mary Mirick, 55, boarder, single, teacher, b. in Mass., parents b. in Mass. Emma Williams, 43, servant, widow, b. in Va., parents b. in Va.
Federal census, 1900, 25 Fifth St., S.E., Washington, D.C.
Samuel A. H. McKim, head, b. April 1826, 74, married 29 years, b. in D.C., father b. in Mass., mother b. in Md., physician, rents. Emma McKim, wife, b. July 1840, 59, married 29 years, mother of 1 child (living), b. in England, parents b. in England, immigration 1855. Mary E. McKim, daughter, b. December 1858, 41, married 4 years, b. in D.C., father b. in D.C., mother b. in Conn.
Mary H. Hill, lodger, b. October 1851, 48, single, b. in Mich., parents b. in N.Y., landlord. 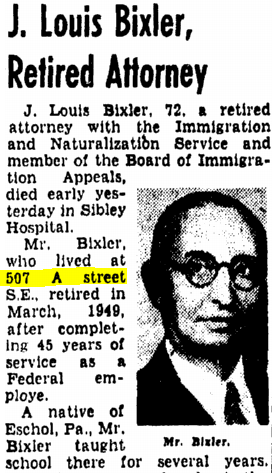 Washington Evening Star, 23 March 1951, p. 18. “D.C. 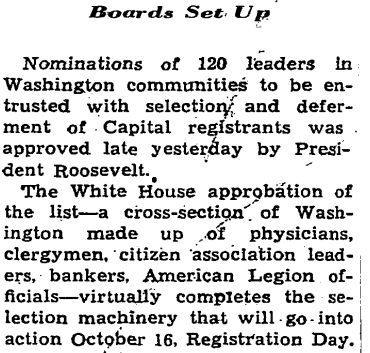 Draft Boards Drawn from All Business and Professional Groups.” Washington Evening Star, 9 October 1940, p. 9. 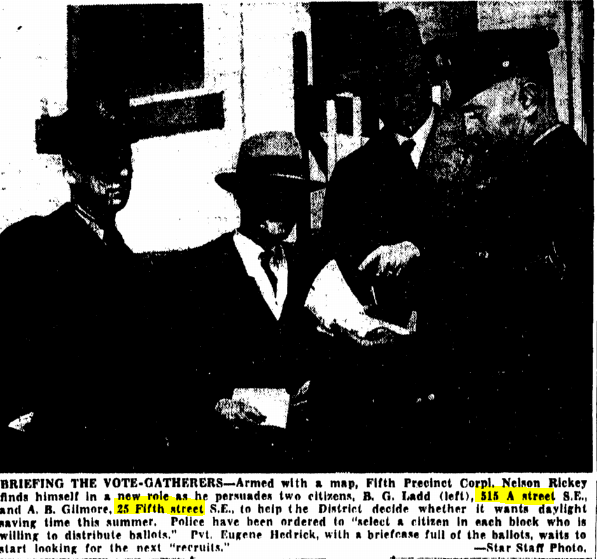 Washington Evening Star, 30 March 1950, p. 4. This photograph—supplied by Eric Freund via Peter Clark—shows the market at A and Sixth as it appeared in 1926. It was later known as the Sanitary Market, and today it is a private residence. 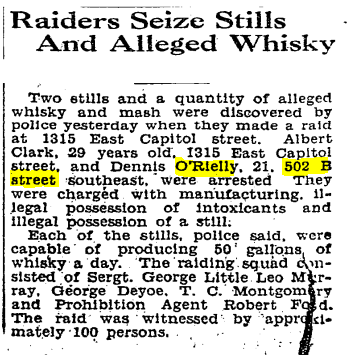 Washington Star, 28 June 1978, p. 1. 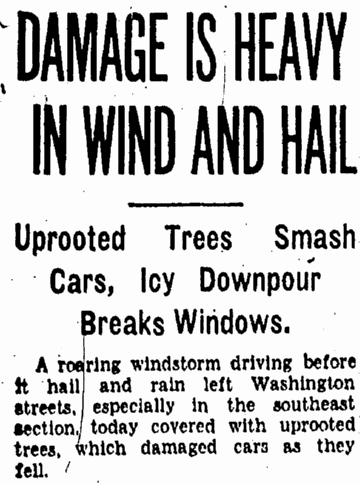 Washington Post, 9 October 1940, p. 1.